The Scarlet Sails celebration in St. Petersburg, Russia is the most massive and famous public event during the White Nights Festival. 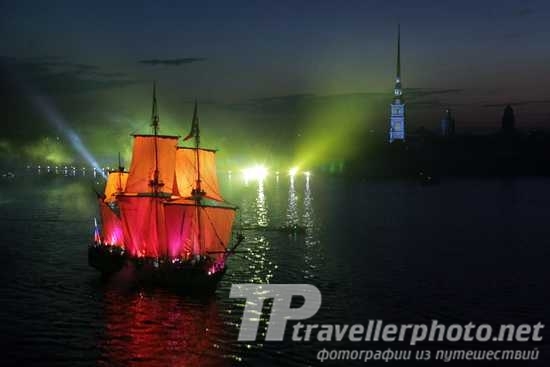 The tradition is highly popular for spectacular fireworks, numerous music concerts, and a massive water-show including battle among tens of boats full of pirates on the waters of Neva river. The Scarlet Sails show celebrating the end of school year 2007 was attended by more than one million people. This tradition began here after the end of WWII, when several Leningrad schools united to celebrate the ending of a school year in connection with symbolism of the popular children's book "Scarlet sails" by Alexander Grin. At the first celebration a boat with scarlet sails was sailing along the English Embankment and the Admiralty Embankment towards the Winter Palace. Although it was designed to update the rusty revolutionary propaganda, the "Scarlet Sails" tradition eventually evolved into a massive demonstration of freedom from "schools and rules" and became the most popular public event ever since, celebrating the ending of school year annually. Crowds of about one million people are treated to a wide variety of free entertainment provided by the city of St. Petersburg. Entertainment also includes appearances by popular rock stars, as well as St. Petersburg Symphony Orchestra, ballet, and other classical acts, performing on several stages simultaneously during the days of the event. The show also includes a series of large-scale events on the waters of Neva river, such as rowing and motorboat races, and a massive battle with pirates culminating with appearance of a tall ship sporting spectacular "Scarlet sails." The show has been always the essential part of the White Nights celebration.